It’s been over a year and a half since the last major release, but this update definitely deserves it. 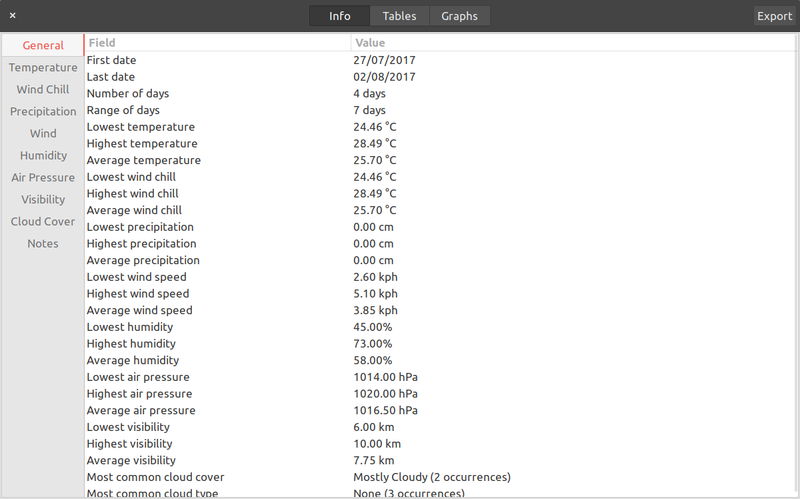 WeatherLog’s interface hasn’t changed much since the first releases; it’s always been a menu-driven application that displays it’s data in lists and tables, usually organized through tabs. While this was perfectly usable, it resulted in a user experience that was often not very streamlined, with plenty of redundancy and a lack of organization. I’ve worked to continually minimize this to a degree, but it’s always been there. That’s why I decided to work on an update that focused entirely on the UI. Almost nothing was untouched by this update. Nearly every dialog was simplified or reorganized, and in many cases made to visually look better. A couple ideas in particular were the main motivators for WeatherLog 5.0. First, related functionality was combined as much as possible, as long as it would still make sense. For example, dataset management was previously done through five different dialogs, but because they all used the same interface (only different button text really), this could be reduced to one centralized dialog. Second, I moved all the windows to use GTK+’s header bars, which allows titles, toolbars, and menus to be combined into one simple compact title bar. The menu bar and tool bar are completely gone; the buttons and functionality have simply been moved into the header bar. The tab switcher has been changed to a stack switcher so that it can be repositioned and have nice fancy transition animations. The search feature has been completely removed from dialogs, and instead incorporated directly into the header. Instead of the entire title being used to show the dataset name, it is now displayed on the dataset switcher button. There is still a GNOME-style app menu, but it’s display depends largely on the desktop environment of the user. Other windows received similarly large changes. The Current Weather feature now shows an improved location selection in the same dialog as the data, allowing multiple searches from the same instance. The title is replaced with a stack switcher here as well. 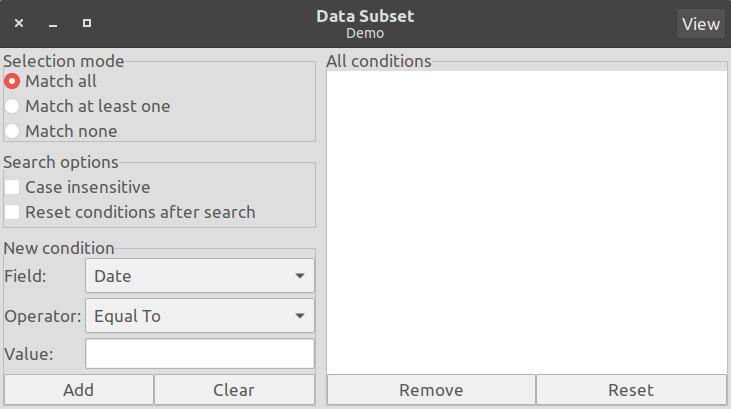 The dataset management features are now in one dialog, with a simplified and cleaner display. The new Preferences dialog is cleaner and better organized, with headers and extra spacing for clarity. Other dialogs received less drastic changes. All were changed to use header bars, and in general there is now a greater focus on readability. All applicable windows and dialogs now use header bars. Weather dialog now includes location selection. Improved appearance of Weather dialog. Data Subset now allows multiple conditions for the same field. “Date” is now a valid subset field. Removed Data for Selected Dates. This functionality now exists as part of Data Subsets. Adding a condition now longer clears the condition input fields. Info, Charts, and Graphs dialogs are now merged into a single dialog. Removed Merge Datasets. This functionality is already covered by Copy Data. Enter key in dialogs should now activate the most used response. Combined search into the header bar. Change default case sensitivity to insensitive. Increased default window heights and widths. Added the app menu; removed the other menus. Added spacing to many dialogs. Search results dialog now shows the search term. Change Add Data autofill notification to display as a notification bar instead of a dialog. Renamed “General” info to “Overview”. Data columns are now resizeable. “JSON indent” and “JSON indent amount”: not something that should be exposed user side. “Forecast period”: was not respected by OpenWeatherMap; did nothing. Added new dataset management window. Transitioned application class to GtkApplication. Removed no longer used dialogs and functions. Fixed Data in Range continuing when the close button had been pressed. Fixed Import throwing an error when the user tried to import a file in the wrong format. Fixed search insensitive case not working when the search term was not all lowercase. Use GTK’s header bars to integrate toolbars and menus into the header. This makes the UI more compact and visually better. Merge similar features. 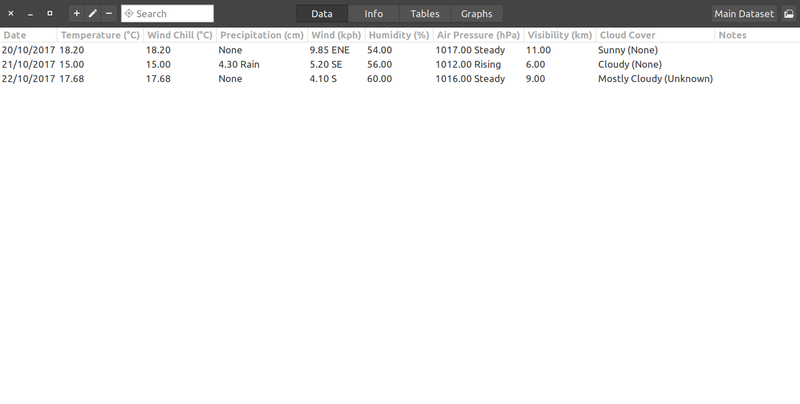 For example, Info, Tables, and Graphs dialogs all display in one window now. Merge related features. All of the dataset dialogs will be combined into a single dataset management dialog. Remove redundant features. Merge Datasets is gone, as it merely replicated part of Copy Data’s features. Data for Selected Dates is also removed; note that there is no equivalent to this in 4.16, but changes to Data Subset will make this redundant now. Move away from a reliance on menus. The goal is to have only one small GNOME-style application menu. This will be easy to do when the above changes are complete. With these in mind, here’s some (early) screenshots to show changes. Here’s what the new main interface looks like. Note that this will definitely change (a few buttons/menus in the header will be added). Click on the images for a full view. The addition of a subtitle allows the title text to be made more readable and properly structured. Removing the toolbar and adding the buttons to the header saves vertical space. The same is true for the move from using a notebook (tabs) to separate data views to using a stack. Stacks also have the advantage of animating nicely (the views slide in from the side on change). The Weather dialog looks quite nice now. As shown here, header bars don’t actually need titles if they’re not contextually necessary. In this case, putting the stack switcher in the place of the title functions perfectly clearly as a title. A label for the location is new as well, to make it bigger and more attention-getting. I’m not entirely happy with this still though. I’d really like to merge the location selection dialog into this, but I’m not sure how to visually do that best. Data in Range selection dialog also shows quite an improvement. When using a header bar, action buttons are combined into the top, instead of being placed on their own on the bottom. This dialog also demonstrates a fairly minor but significant UI change: “cancel”/”close” buttons are no longer used. 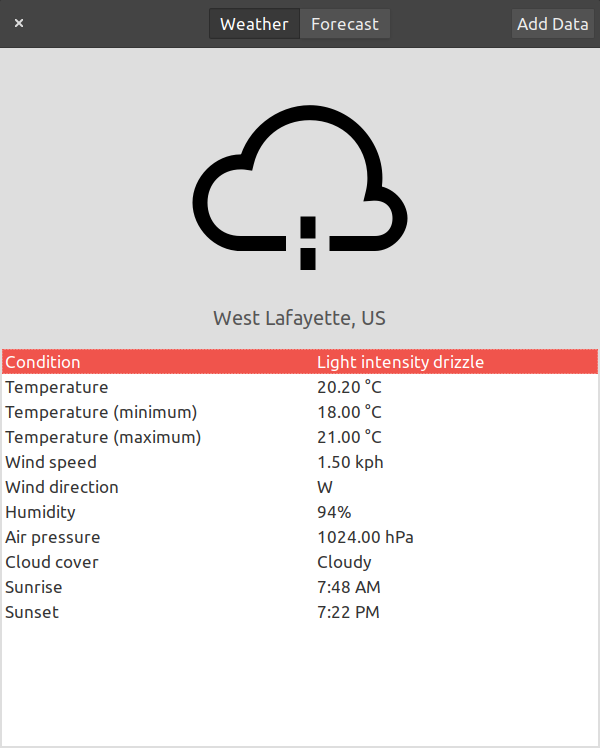 The combined Info/Tables/Graph dialog uses the same idea as the Weather dialog. As one more example, the Data Subset dialog shows the use of additional in-dialog buttons. There’s no reason those can’t be used with header bar -based dialogs, but sometimes it makes more sense to move buttons into the header. In this case, there used to be four buttons below the conditions list: “Remove”, “Reset”, “Close”, and “View”. “Close” was removed (see above), and “View” was moved up as it contextually didn’t make sense in it’s prior location; the buttons along the bottom were otherwise all meant for condition manipulation.